Comments: Evergreen conifer, native to the Himalayas in India. This species has green to blue-green needles, and light green female cones bourn on the upper surface of the branch. Though most Deodar have a somewhat weeping habit, this cultivar exagerates this feature. 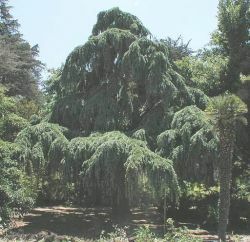 According to Nelson Kirk, this specimen is likely the largest of its kind in California.